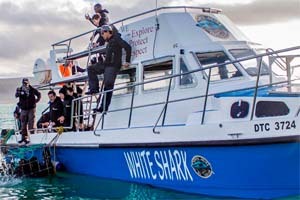 Great White Shark Tours is an excellent operator that offers 5* service. The price tag of R1970 per person is justified by the service quality and passion you receive from the owner Brian McFarlane. The trips are the longest at sea between the operators and even though the boat takes a maximum of 35 people it is very large and spacious. More people means more prime at sea and not less time in the cage. 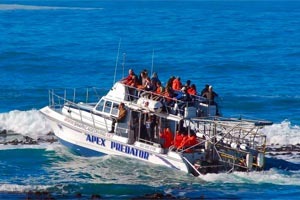 Apex Predator is a fantastic purpose-built boat for the shark cage diving and viewing. There is plenty of space on the boat to move around and you can view the sharks from the lower and upper decks giving you excellent vantage points to get that ‘money shot’. 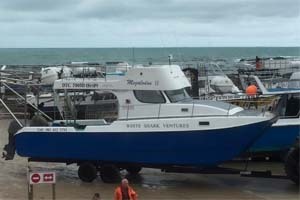 The boat is very wide and it’s centre of gravity is low making it very stable on the sea thus reducing the chances of seasickness. No experience is required if you want to go down in the cage. 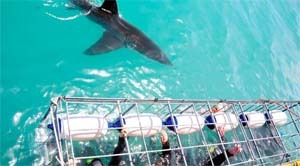 Sometimes if you are unlucky the water may be extremely rough or far too murky to use the cage but even if this is the case the viewing from the boat is still exceptional. 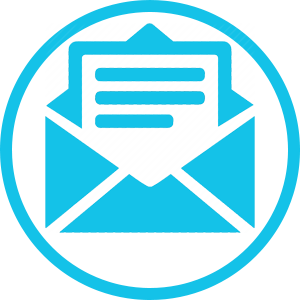 The cage is made with 12mm galvanized steel mesh. This is ample to protect the divers from the sharks, but they have never tried to get to divers in the cage. The cage is attached to the boat at all times and is easy to access, so if you are too scared then you can climb out at any time. There is a lid on the cage which comes down over the divers to protect them from the top. 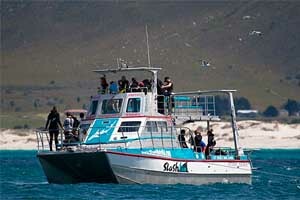 The cage can accommodate 7 divers comfortably and there is plenty of space and opportunity to dive multiple times on the trip. 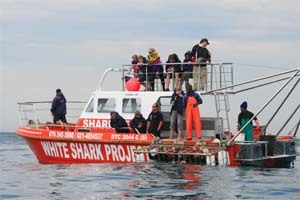 The floats on the cage are carefully positioned to enable divers excellent viewing space underwater and on the surface when the sharks are passing. 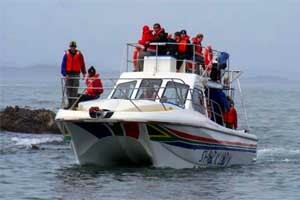 The trip normally begins at 9-10am at the great white shark tours crew house in Kleinbaai which is 2 km along the coast from Gansbaai. 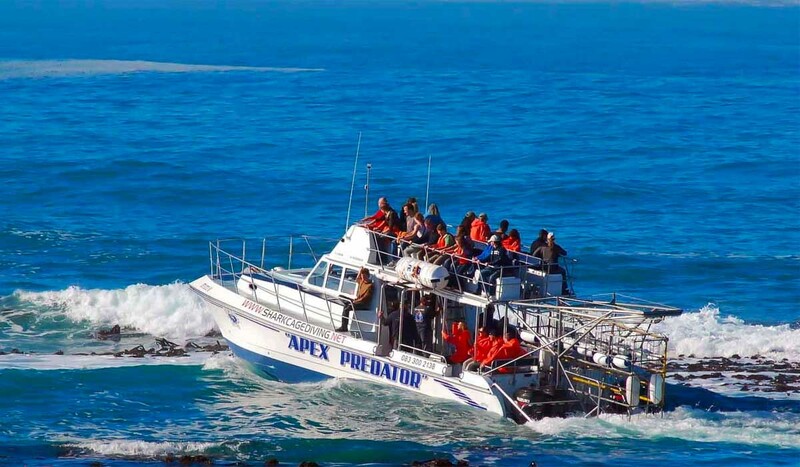 You will receive a breakfast spread and then safety briefing before heading down to the boat ‘Apex Predator’. The ride out to the Island takes approximately 15 minutes and then they will find a suitable place to drop anchor and start chumming. The crew use a special chum mixture and drift the chum slick towards the reefs where the sharks are roaming. Once the Great Whites arrive, you will have the opportunity to photograph these awesome animals feeding at the surface next to the boat. This is when you will kit up in your dive gear and cimb into the cage! It is recommended that you book well in advance for your trip and allow at least 2 days diving in case of adverse weather conditions. Vinyl side curtains are on the boat on the lower deck to give additional protection from the wind and water spray. 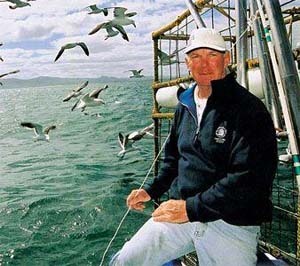 Brian McFarlane, owner of Great White Shark Tours, was a professional diver and skipper who spent his lifetime at sea as an abalone, fisherman, wreck diver and diamond diver. Brian as many other divers in these waters, has had many encounters with the great white sharks and many other types of shark. 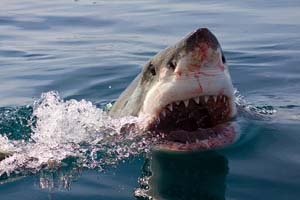 He was one of the old time Shark fishermen when this was accepted and Great White Sharks were not protected. He caught 33 great white sharks but he sorely regrets killing them and now spends his time and efforts into showing people the beauty of the sharks with his cage diving company. 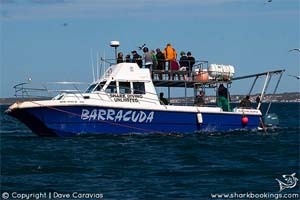 Brian is the only owner of a shark cage diving company that goes out on the boat daily. This shows his passion for the sharks and also showing people the beauty of the sharks! 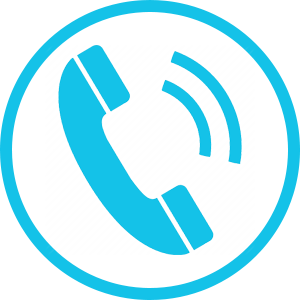 His presence on the boat makes the difference and client service and focus is second to none. All operators are trained in CPR Management and have a media flow chart on board in case of an emergency.